Characterised by General Erich Ludendorff as “the black day of the German Army”, the first day of the Battle of Amiens set the tone for the last one hundred days of the First World War. 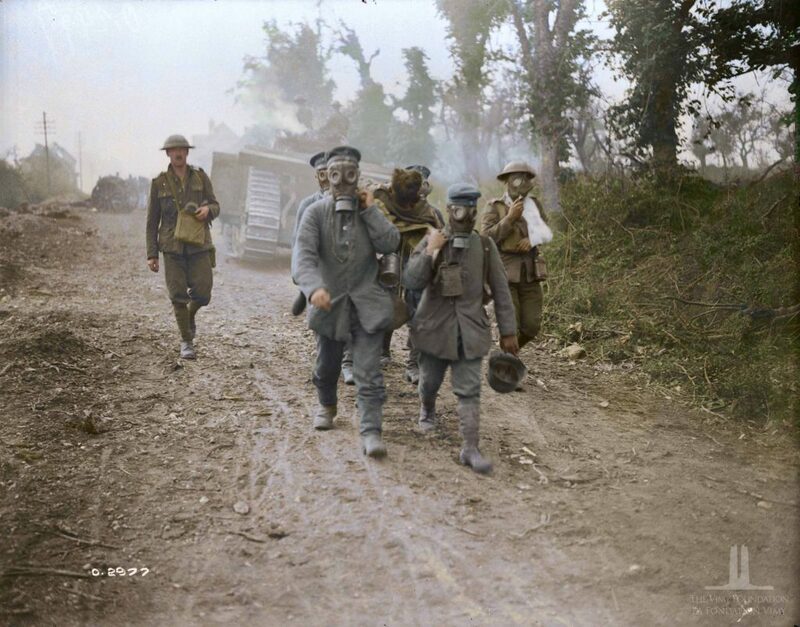 At 4:20 AM on 8 August, the Canadian creeping barrage opened, and all four divisions of the Corps began their advance behind a whirring cloud of shrapnel, poison gas, and smoke. Amiens had been planned in strict secrecy in the summer of 1918 by Field Marshal Haig, building on a proposal submitted by the Australian commander John Monash, that called for a combined infantry and tank approach to breaking the German lines strung out on the front after the halted Spring Offensive. The attack was planned without an initial bombardment; the first shots would be ranged on German guns to take them out by zero hour, with a creeping barrage for protection. The Canadian Corps were secretly moved to the Amiens front, to conceal that an attack was about to take place. A diversionary force was sent to Flanders, leading the German Army to think that the offensive would begin there, and the final Canadian units did not arrive in place until 7 August. The advance on the morning of 8 August was swift and brutal; most of the German artillery pieces were knocked out, but the Canadians still had to deal with dangerous machine gun nests all along the German defensive lines. The Corps had four lines to cross, which they achieved by the end of the day, before the German defense hardened and the battle slowed down. Canadian gains for the day were 13 km deep across a total frontage of over 20 kilometres. Amiens was an astounding success, the largest one of the war so far for the Allies, and showed that the German Army was beginning to lose morale, as thousands were taken prisoner, some without shots fired. However, the eventual victory came at a very heavy cost; Canadian casualties on 8August alone were 1036 killed, and 2803 wounded. The Amiens battle would cost the Canadian Corps 11,822 casualties, which they could ill-afford. German casualties are recorded at 75,000 killed, wounded, or taken prisoner. Battle of Amiens. Tanks advancing. Prisoners bring wounded wearing gas masks. Aug 1918. Library and Archives Canada/PA-002951 (modified from the original). Colourized by the Vimy Foundation and Canadian Colour. Jean Brillant, 22 Battalion (Van Doos). Already a recipient of the Military Medal, Brillant led his company against machine gun nests on three separate occasions and was wounded three times. He died of his wounds on 10 August. Cpl Herman Good, 13thBattalion, who single-handedly captured a German machine gun nest, and later the same day organised the capture of 3 German artillery pieces. Good survived the war and worked as a fish and game warden. Srgt Robert Spall, PPCLI,who provided cover for his isolated platoon with a Lewis gun, allowing them to retreat, before he was killed on 13 August 1918.